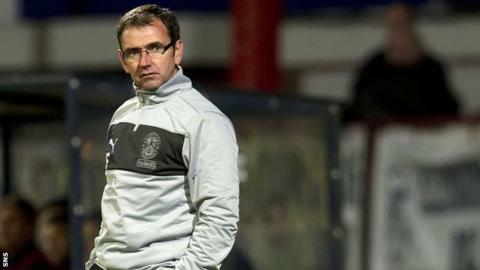 Pat Fenlon was more concerned at his Hibernian side's failure to take anything from their game at Easter Road against Aberdeen than league leaders Celtic's home defeat by Inverness. "Results elsewhere don't really come into it," said Fenlon. "I am desperately disappointed for the players. We didn't deserve to lose." Celtic top the SPL on 25 points, despite their 1-0 loss to Terry Butcher's side, and they have a game in hand over Hibs and Aberdeen, who are only a point behind. "It feels worse than last week's defeat to Dundee because we didn't deserve anything out of that, but this week we deserved to win," lamented Fenlon. "Even a draw I think would have been a travesty. I thought from start to finish we were tremendous. "Their keeper [Jamie Langfield] was fantastic, particularly the save he made from Eoin Doyle in the first half. "I'm not sure exactly how many shots Leigh Griffiths has had but again the goalkeeper has made some great saves. "We have to take it on the chin and move on. "We didn't take our chances. That happens in football. I suppose that's the madness of the game. "The players are down because they know they put in a great shift and have got nothing out of it. "It drives you mad when you perform so well and you don't get anything out of it." How serious is the Hibs and Aberdeen challenge? Read more on How serious is the SPL challenge from Hibs and Aberdeen?